This entry was posted in Art -- there is art here!, Grapevine, Travel and tagged airport, cattle, clothes, Dallas Fort Worth, DFW, longhorn, manikins on August 21, 2016 by admin. SeaTac Airport Alaska terminal has a 21 and older area for boarding passengers to relax while waiting for their plane. 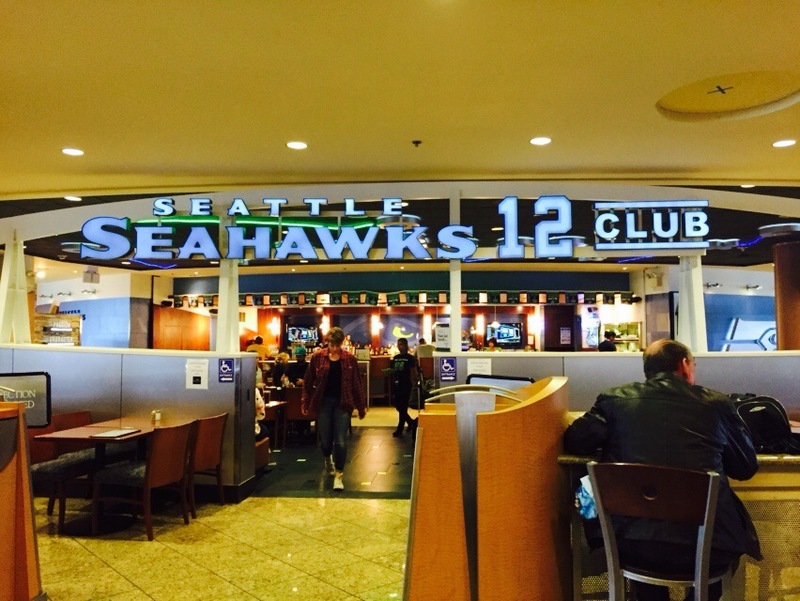 It is called Seahawks 12 Club. A quick peek inside showed many tables to sit and while away the time, some food and Seahawks paraphernalia. 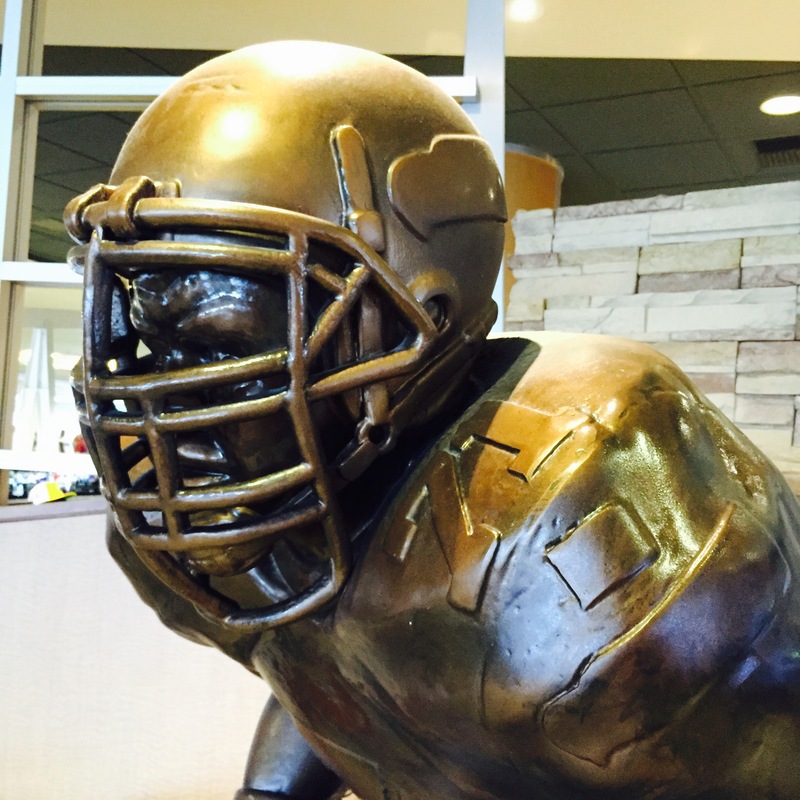 This statue is of Walter Jones #71 who was a offensive tackle from 1997 to 2009. I’ve also included a picture of the Starbucks at the terminal. 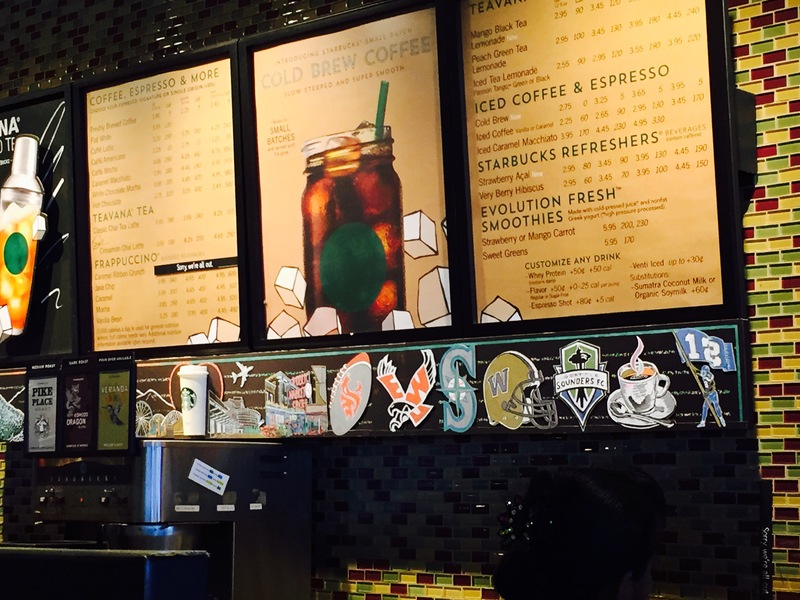 I really like how they have the Seattle symbols lined up! 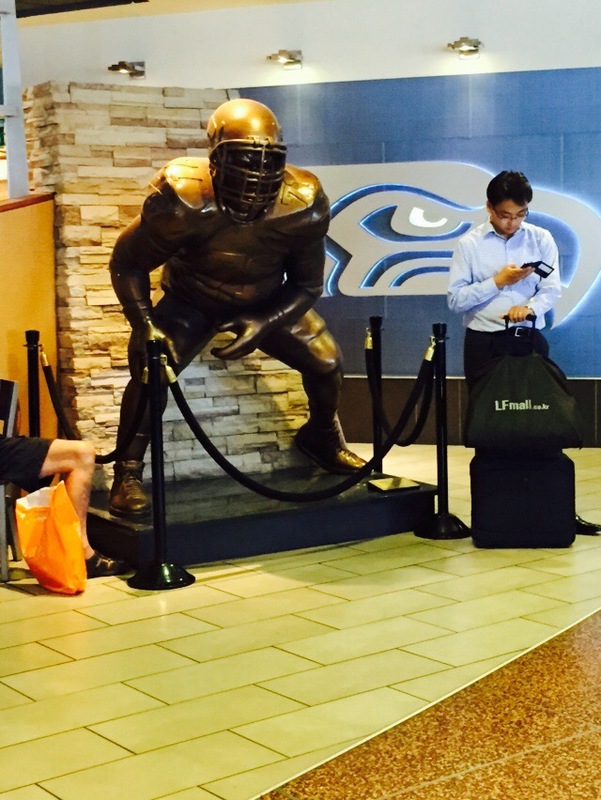 This entry was posted in Over 21, Restaurants, SeaTac, WA State - King County and tagged 71, airport, bar, club, jones, Seattle Seahawks, statue, Walter on August 4, 2015 by admin. 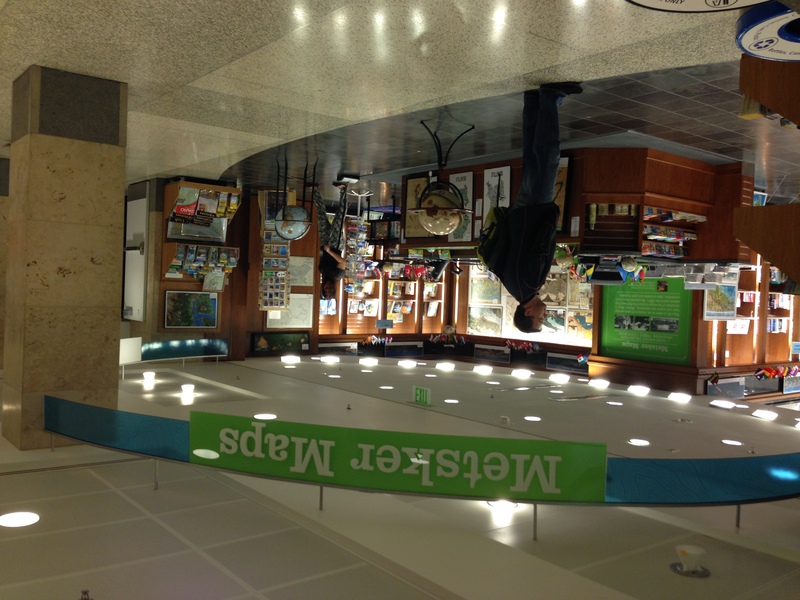 I was strolling through SeaTac Airport going to my flight when I stumped upon Metsker Maps at Concourse B . That’s right, I know remember that they opened an airport location. I love maps and thus love this store! The woman working there was so pleasant and knowledgeable and their selection was great. 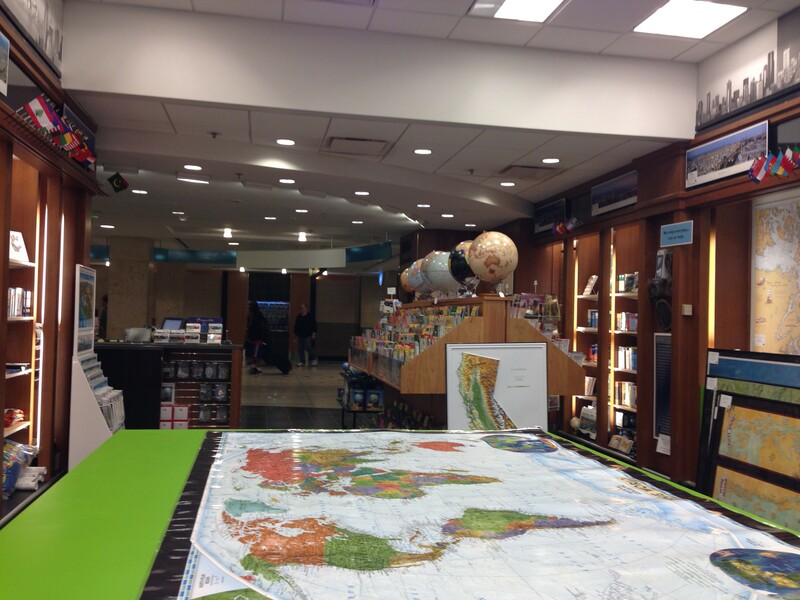 This entry was posted in SeaTac, Stores and other places that sell you things, Unique Shopping (stores with some personality) and tagged airport, books, concourse B, globes, Maps, Metsker, Metsker Maps, SeaTac, Seattle, store on August 9, 2014 by admin. Embassy Suites, Portland Airport is really nice. I stayed on the 8th floor.The breakfast buffet was robust and there are snacks in the evening. The picture of the orange with flowers is of our center piece at dinner. This entry was posted in Hotels, Other States - OR, Portland and tagged airport, Embassy Suites, Hotel, OR, Portland on May 18, 2014 by admin. LAX is the jump off point to my 14 hour flight to Australia. 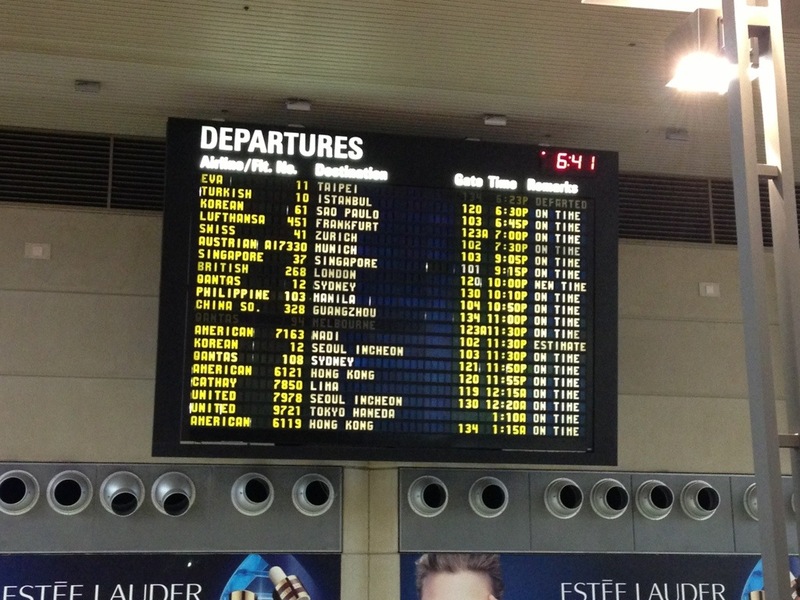 It is the 6th busies airport in the world. My flight was Quantas 108. 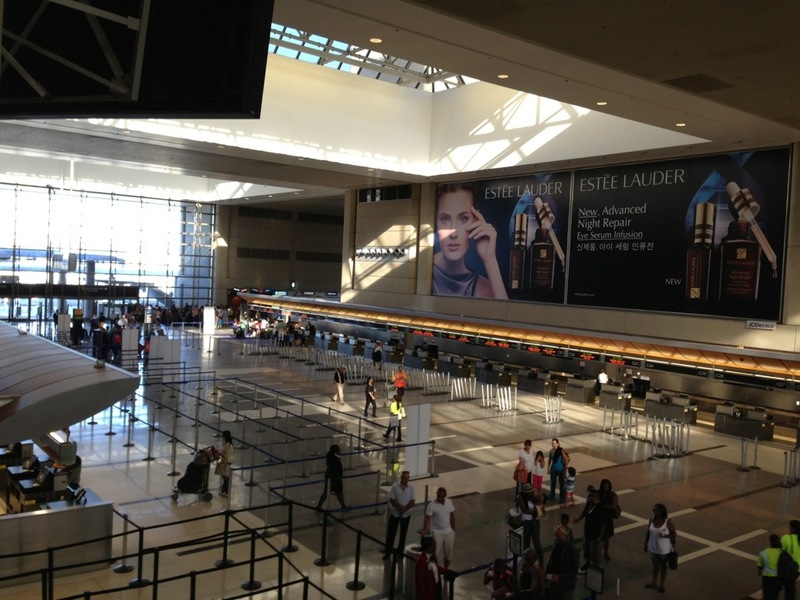 This entry was posted in Los Angeles, Other States - CA, Travel and tagged airport, flight, LA, LOS ANGELES INTERNATIONAL AIRPORT, Los Angles, travel on July 8, 2013 by admin. It isn’t the best photo that I’ve taken, in fact I made my daughter take it as the car was moving! This entry was posted in Government, SeaTac, Travel, WA State - King County and tagged air traffic control, airport, safety, SeaTac, tower, travel on April 25, 2011 by admin. 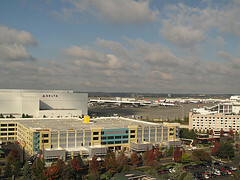 Today’s new place is the Sea-Tac airport, with the photo taken from the top floor of the Doubletree Inn (yesterday’s new place). This photo was a happy accident because I was just lost looking for a meeting that I thought was upstarts. It wasn’t, but this lovely view was! Considering the photo was taken with my phone, I thought it came out pretty well 🙂 The photo below was taken the next day with the better camera, though it doesn’t look all that different. The airport is the 18th busiest in the country and is the primary hub for Alaskan Air. When I checked into the airport on my FourSquare App, there were already 43 people checked in there. 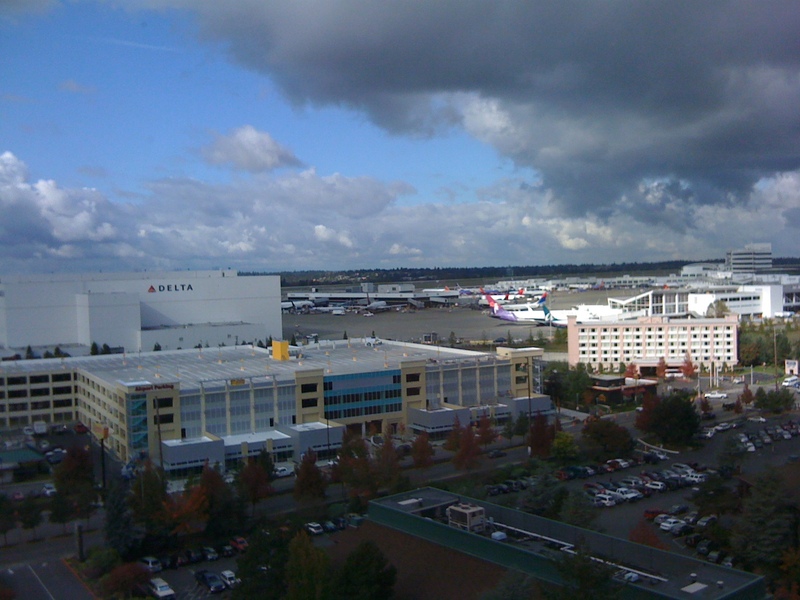 This entry was posted in SeaTac, Travel, WA State - King County and tagged Air, airport, Alaskan, clouds, Doubletree, Hotel, Inn, Sea-Tac on October 15, 2010 by admin.